State lawmakers might have ended a years long court battle over public school funding. But the Legislature’s new Democratic majority hit a few snags in passing some other major policies in 2018. Washington state’s prolonged court battle over school funding appears to be coming to a close, a welcome result of the 60-day legislative session that ended Thursday. The supplemental budget adopted by the Democratic-controlled Legislature added nearly $800 million to speed the state’s takeover of school-employee salary costs, which the state Supreme Court ordered last fall in the McCleary education-funding lawsuit. By taking steps to comply, lawmakers might well end the yearslong legal saga, allowing them to return their attention to new ways of improving student outcomes. This is good news for Washingtonians, who deserve an amply funded school system that delivers a world-class education for the state’s 1.1 million schoolchildren, regardless of which ZIP code they live in. Lawmakers were smart to move up certain accountability reforms aimed at preventing the state from falling behind on its school-funding responsibilities again. These changes include requiring separate accounting of state and local tax revenues — key to ensuring the state covers the full cost of basic education, rather than relying on local property-tax levies to bridge the gap. Lawmakers also wisely retained limits on the size of local levies and how they can be used. The Legislature’s job was made easier by higher-than-expected state revenues — an extra $2.3 billion. Given the possibility of an economic downturn, they should have socked away more money in the state’s constitutionally protected rainy-day fund. Disappointingly, lawmakers did fall short on special education. While state Superintendent of Public Instruction Chris Reykdal said districts needed about $130 million in additional state money for special education, lawmakers ponied up only about $27 million. The Supreme Court still must decide whether lawmakers’ efforts were sufficient. But overall, legislative leaders made a good-faith attempt to satisfy the court, without dismantling important reforms. Here are a few other areas where lawmakers excelled this year, as well as where they disappointed. Cracking down on dark money in politics. 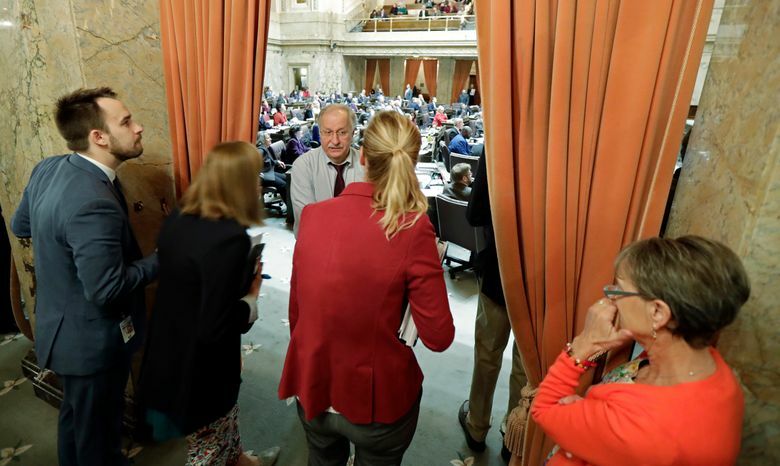 The Legislature approved a plan from Sen. Andy Billig, D-Spokane, to require nonprofits engaging in significant political activity to report their expenditures and top donors. The rules to reduce so-called “dark money” in politics are set to take effect Jan. 1. Hirst and capital budget. The Legislature moved quickly to dissolve a stalemate holding up a $4 billion state construction budget. By agreeing on how to respond to the Supreme Court’s Hirst water rights ruling, lawmakers allowed important public building projects to move forward, while allowing rural property owners to develop land. The Hirst deal also promises $300 million to restore watersheds over 15 years. Voting rights. The Legislature enacted a state Voting Rights Act to increase the chances for racial and ethnic minorities to elect local candidates of their choice. Now cities and counties can voluntarily switch to district-based elections, while providing a process to fix problems with a jurisdiction’s voting system. The law comes after federal lawsuits forced district-based elections in Yakima and Pasco. Yakima elected its first three Latina council members in 2015, and Pasco added two Latino council members last fall. College financial aid. Lawmakers added $8.5 million to reduce the waitlist for the State Need Grant, with plans to fully fund the financial aid program by mid-2022. Falling short on special education. Districts will soon be technically prohibited from using their local levies to pay for these expenses. Legislators must correct these problems. Failure to enact sensible gun control. Lawmakers passed a ban on bump stocks (devices that allow semi-automatic rifles to fire more rapidly). But they failed to act on other common-sense proposals, including increasing background-check requirements for semi-automatic rifles and raising the age to purchase such weapons. Failing to repeal the death penalty. Death-penalty sentences waste taxpayer resources and are unevenly applied. While the Senate passed a measure to eliminate capital punishment in Washington state, the House did not put the question to a vote. Transparency and open records. Lawmakers attempted to shroud their business in secrecy by passing a bill to exempt themselves from the state’s Public Records Act — a measure Gov. Jay Inslee vetoed, but only after more than 20,000 constituents flooded his office with emails and calls. Then, the Legislature again rushed through its final budget deal, leaving minimal chance for citizen input.